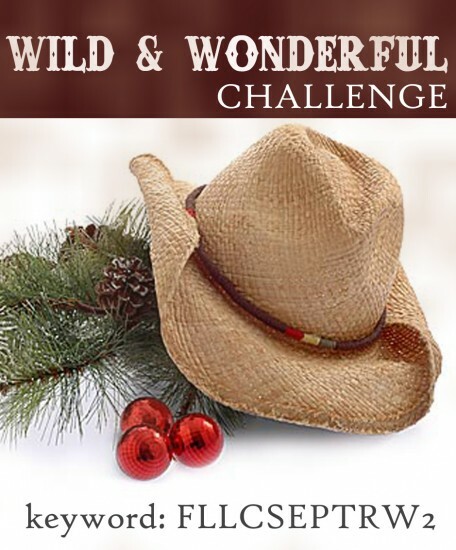 The CAS-ual Fridays Challenge is a fun one this week - to be inspired by our own personal blog banner! My main element of inspiration was the leaves with text on them. I had originally wanted to go with more green, but then I decided to experiment with a couple of shades of Dylusions spray by Ranger: Squeezed Orange and Fresh Lime - sprayed on a 4" square of Sahara Sand CS. The leaves were cut using Sweet 'n Sassy's dies on some text DP from the Lost and Found Two "Rosy" pad, then sponged with Tea Dye distress ink. Layering it on Pumpkin Pie CS then popping it on foam strips on top of kraft gave it some more dimension. 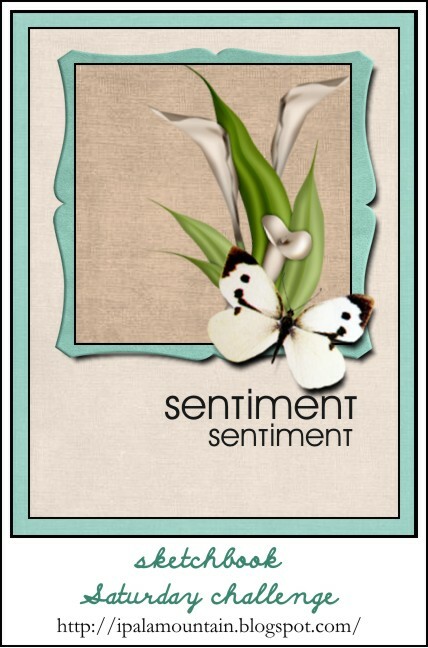 The sentiment is a Plain Jane stamp by Verve. This is also for the Friday Mashup Challenge to create a fall themed card or use twine or mash it up and use both. I went with the autumn theme only to keep it CAS. I plan to give this to one of our two pastors at an appreciation dinner our church is having in October. Thanks for stopping by...have a great weekend! I'm going to be working today and tomorrow evening, so stamping time will be next to non-existent! It's hard to believe this is the last Friday in September! Once again, it's time for another Raise the Bar challenge and this time Joni has a great color challenge based on this photo! I immediately thought of this DP by 29th Street Market called "Elegant Print/Poised Purple" that I've had for some time. It has the solid purple on one side and the print on the reverse side. My banner BG was inspired by a card I saw on Pinterest by Tammy Fite (unable to link to her card because it's a SU demo only site). ACCESSORIES: Lace trim, Rolled rose Die-Namic by MFT, Foliage die by Spellbinders, Tiny Sweet Scallop die by Verve, Fishtail Flags STAX Die-Namics by MFT. Hop on over to the Raise the Bar blog for more inspiration by the other bartenders! Hope you can play along with us! 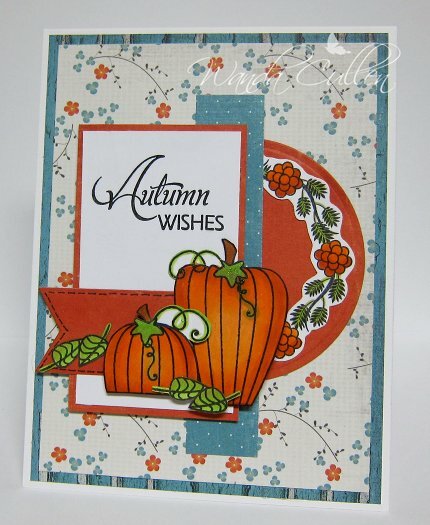 I absolutely love the colors of fall, so when I saw the Flourishes Timeless Tuesday Challenge was to create a card with a fall theme, I knew I had to play! The brown panel is embossed using a woodgrain EF and jute twine added for that rustic fall feel. I used the cut file from Flourishes to electronically cut the outline on X-Press It Blending Card using my Silhouette Cameo. 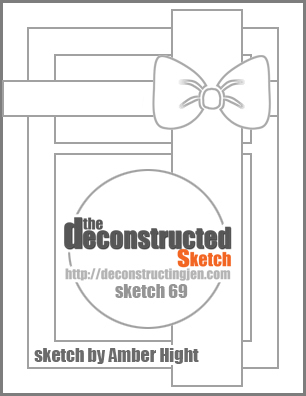 This card also uses Taylor's sketch for the Sketch Challenge on SCS. ACCESSORIES: Woodgrain EF, Jute twine, Chocolate pearls, Copics. 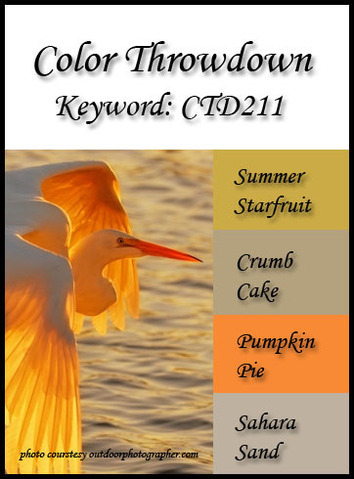 It's my turn to play hostess for this week's Color Throwdown Challenge and I've got a rather different color combo for you to try! I was fascinated by the warm, gradient colors that the photographer captured on this egret flying into a sunset! Hopefully, it will translate into some fabulous fall cards! Once again, I went with these whimsical pumpkin images with matching dies from MFT and created a very simple, straight forward card. Hope to see you playing along with us! 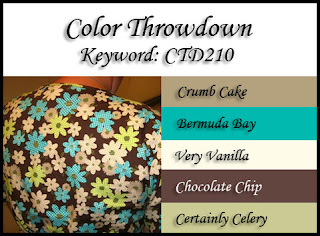 Before you go create, check out the other team members' creations on the Color Throwdown blog. You'll get the challenge details there as well. 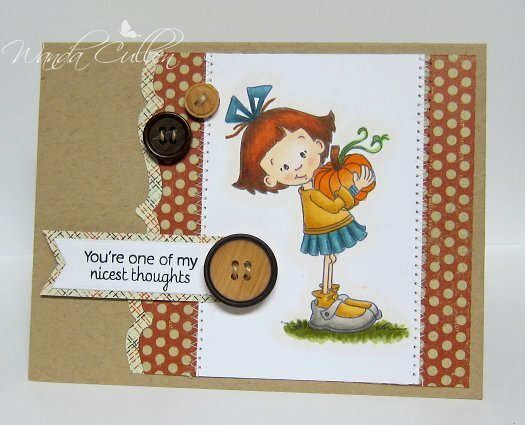 ACCESSORIES: Pumpkin Die-Namics by MFT, Burlap strip, Jute twine, Wooden button (SU), Tiny Tag die by PTI, Sheer ribbon. I geared up the Silhouette Cameo for this card for Mothermark's Teapot Tuesday Challenge and for the Color Challenge on SCS (Pacific Point, Not Quite Navy and Sahara Sand). The teapotters' theme is to be inspired by church and for this element...you have to see the inside which includes a verse from Psalms 31:24: "Be strong and take heart all you who hope in the Lord" overstamped by Verve's curvy cross. I'm hoping this will be an encouragement to Dorothea, the destination for this week, as she is once again facing a bout with cancer. 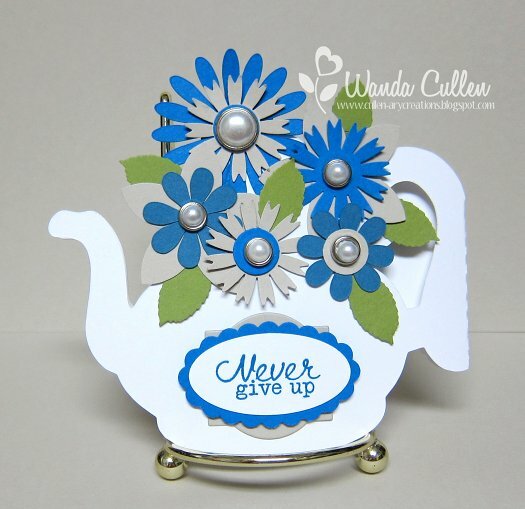 The teapot card shape and the flowers are all cut by the Cameo. Leaves were punched using Martha Stewart's rose leaf punch. The sentiment is from Verve's Borderline set. Oh, baby! 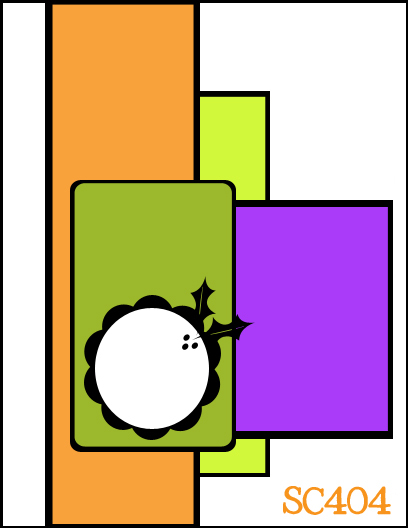 There's another Mojo Monday challenge on board and because it's the last Monday of the month...it's circle or square-shaped card time! Since this is a 4 1/4" square card, I knew I wanted to use this sweet little baby carriage from the new Treasured Words set. I paper-pieced most of it and added two button brads for the wheels. For more inspiration by the other mojomakers...head on over to the Mojo Monday blog and check out their fabulous entries! ACCESSORIES: Seam binding, Circle Nesties, Fleur de Lis Squares Nestie, Button brads, Black pearls, Charming banner die by Verve. A quick post here with a card for the Waltzingmouse Sketch Challenge. I gold embossed the ornament stamp then popped the sentiment and added a small layered poinsettia using the SB poinsettia dies (edges were sponged using Riding Hood Red ink). ACCESSORIES: Diamond EF, Gold EP, Gold Cord, Retro Squares border Die-Namics by MFT, Fern punch by MS, Gold glitter dot, Pennant trim die by Verve, Corner rounder, Oval Nestie, Poinsettia dies by SB. I wanted to play along with the CASE Study Challenge which is to CASE Torico's card on the left. Since it's now officially fall, I decided to ink up this sweet digi image by Sassy Cheryl. My sewing machine decided to bunch up the thread and totally get stuck, so in rectifying the thread problem, I ended up with a small hole in my paper...Grrr! Thus the two added button embellishments which actually worked out well in the end - lol! These wooden buttons are in the new SU catalog...love them! It's my first time using this new Verve Flourished Trim die and love the option of reversing the edge to add a contrasting paper edge. STAMPS: Snow Wonderful by Flourishes. PAPER: Jovial pad by BasicGrey, Black, Red, White, Old Olive. INK: Memento Tuxedo Black, Old Olive, Riding Hood Red. 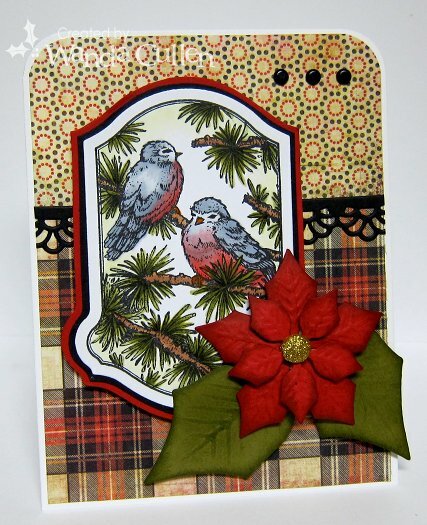 ACCESSORIES: Poinsettia die by SB, Classic Keyhole die by Flourishes, Scallop border Die-Namics by MFT, Corner rounder, Black brads. 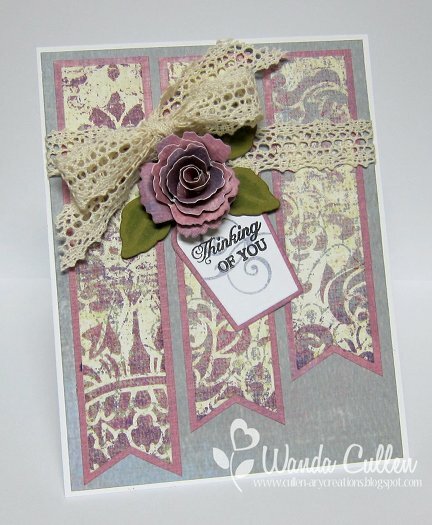 Another week has rolled around (far too quickly since it's been a vacation week for me), and this week's Raise the Bar Challenge is to use damask and/or swirls on a card. 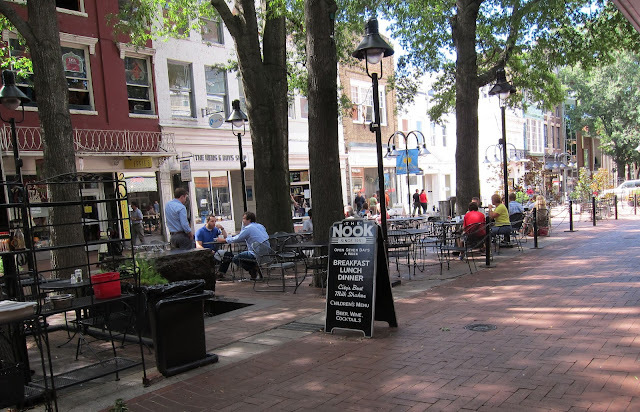 I ventured across Afton Mountain on Wednesday to a great stamp/scrapbooking store in Charlottesville's downtown pedestrian mall. While there, an employee showed me how to turn your embossing folders into stamps by using a piece of 1/2" fun foam! You first heat the foam with a heat gun then quickly put it in the EF and run it through a die machine (I have a Big Shot). Your foam should now have the embossed pattern on it. I swiped 3 different colors of distress ink pads over the foam pad, misted it slightly with water and then "stamped" it on paper. No two tries are ever the same, but I liked the unique BG it created! I used Chupa's Sketchbook Saturday Sketch for the layout and couldn't resist these primitive pumpkins...again...just LOVE them! ....and this was the outdoor patio in the downtown pedestrian mall where I grabbed a bite of lunch at The Nook and had a super yummy portabello mushroom sandwich with basil pesto! STAMPS: Primitive Pumpkins (MFT), Super Dad (Verve)-flag outline. PAPER: Pumpkin Pie, Old Olive, White. INK: Crushed Olive, Rusty Hinge, Spiced Marmalade distress inks by Tim Holtz; Pumpkin Pie, Old Olive and Soft Suede by SU. ACCESSORIES: Swirls EF by CB, Postage stamp border and Open scallop border Die-Namics by MFT, Chocolate pearls, Jute twine, Stripes EF by SU, Ribbon banner die by Verve. It's Wednesday and that means it's time for another Color Throwdown Challenge. Tammy has some of my fave colors in this great combo! This card is also for the Monday Technique Lover's Challenge on SCS which is to use rolled flowers. These dies from MFT are some of my fave with the petal roller tool from Imaginisce being the secret to being able to curl down the edges of the flowers. 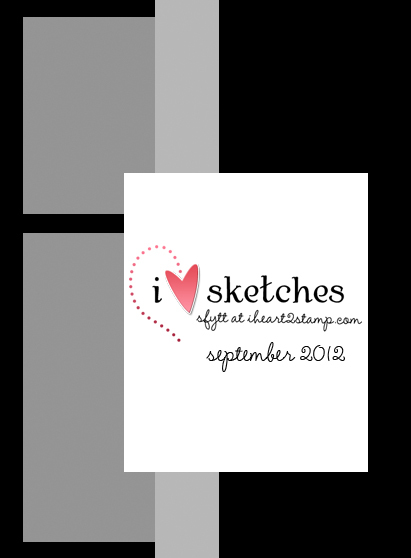 Jen Del Muro's September Sketch For You To Try was used for the layout. 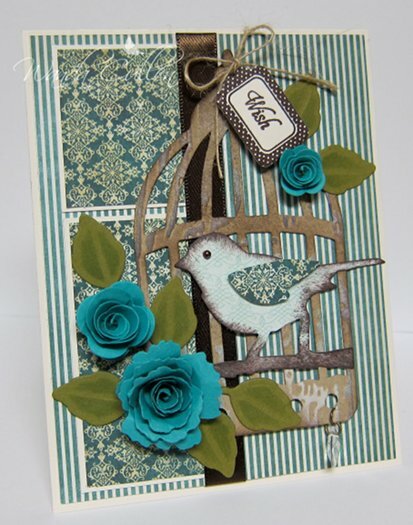 ACCESSORIES: Caged bird die by Tim Holtz, Rolled flower Die-Namics by MFT, Tiny Tags die by PTI, Jute twine, Chocolate Chip satin ribbon by SU, Charm, Chocolate pearl used for bird's eye. 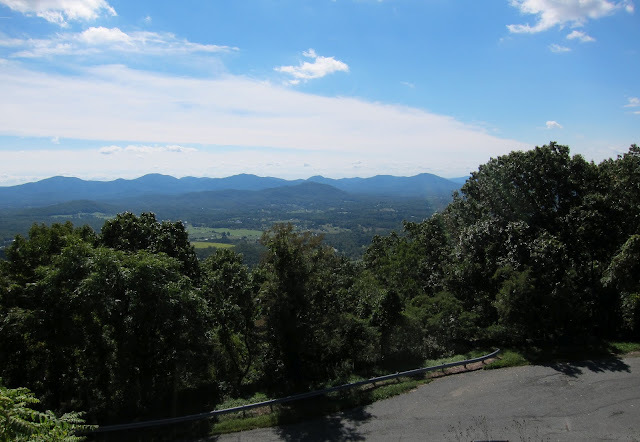 It's a dismal day with tornado watches being broadcast until 7 PM here in VA! We lost power during the night and branches are littered all over the lawn! 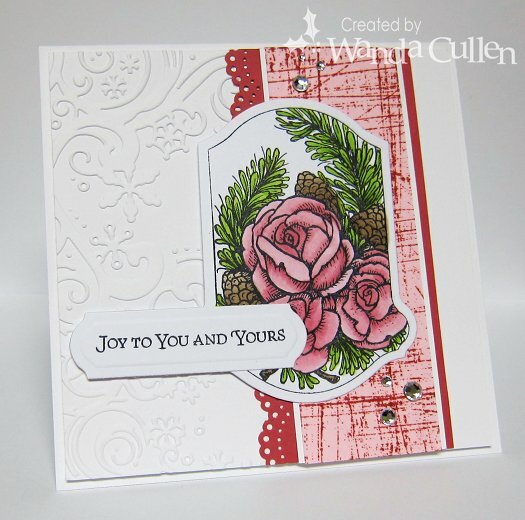 Good day to stamp though, so I took Karen Barber's Color Challenge on SCS to use Primrose Petals, Pink Pirouette and Lucky Limeade and combined it with Flourishes Timeless Tuesday challenge which happens to be this great sketch by Ally. I had to tweak the layout a bit after I glued my pink panel down and realized I hadn't moved it far enough to the left. :-( I stamped the Sanded BG stamp (SU) in Primrose Petals ink on Pink Pirouette CS. I used Memento Tuxedo Black ink to stamp the image on X-Press It Blending Card, die cut it and colored with Copics. 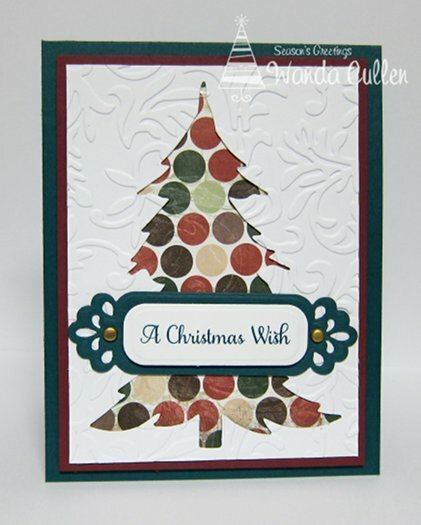 I used a snowflake flourish EF for the BG and added a little bling and now I have another Christmas card for my stash! STAMPS: Petals and Peace (Flourishes). ACCESSORIES: Classic Keyhole die set by Flourishes, Doily Lace border punch by MS, Rhinestones by Recollections, Snowflake flourish EF by CB. COPICS: R81, R85, YG23, YG25, E42, E43, E44. The teapotters have a wedding to celebrate this week! Cathleen Torina (aka ctorina) on SCS has a daughter, Sarah, that is getting married this Saturday. Her wedding colors are cream and gold and we've been challenged to use this color combo for a wedding card. 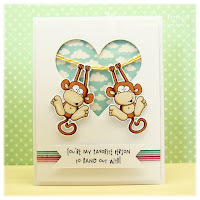 I kept it simple and tried to make it elegant as well...to keep in the theme of Cathleen's elegant cardmaking style. For more details about the Teapot Tuesday Challenge, check it out HERE. 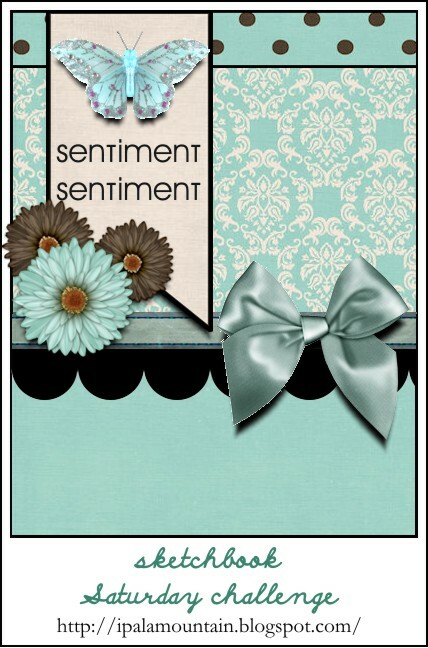 ACCESSORIES: Labels Eighteen Nestie, Ironwork Accents, Victoria EF, Heart border die by PTI, Ranger Queen's Gold EP. Hello and welcome to another Mojo Monday Challenge! I loved this unique layout and with the cooler fall days approaching, I was in the mood to color up these Verve-alicious pumpkins! I highlighted the leaves with a mint Spica pen to add a hint of glitter. 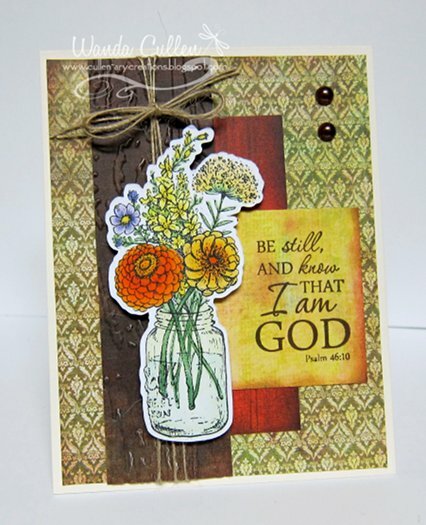 STAMPS: Bountiful Harvest (pumpkins), Harvest Blessings (sentiment & wreath) - both by Verve. 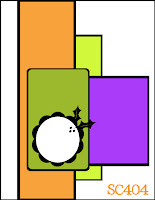 PAPER: On the Bright Side (MME), White (PTI), X-Press It Blending Card. ACCESSORIES: Circle Nesties, Fishtail Flags STAX Die-Namics by MFT. COPICS: YG93, YG23, E99, YR12, YR15, YR18. So...head on over to the Mojo Monday blog for some great inspiration from the other mojomakers! Hope you'll be able to play along with us and be sure to link up your card to the linky service and if you post to a public gallery, please use the keyword Mojo259. Good Friday my friends! It's time for another Raise the Bar Challenge and this week our theme is "I believe I can fly" - use anything with wings. I decided to go batty with this challenge and used Amber Hight's great sketch for the Deconstructed Sketch No. 69. I fussy cut the bats and added some 4mm wiggle eyes. 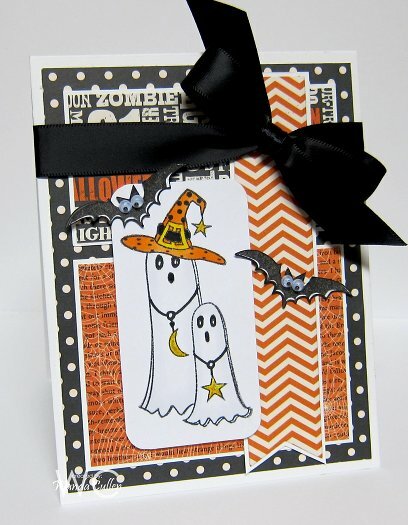 I am loving the Halloween patterns in this "Haunted" paper pad by MME and the sketch was perfect to combine 4 of them! ACCESSORIES: Black satin ribbon (SU), Corner chomper, Fishtail Flags STAX Die-Namics by MFT, Buttermilk Spica pen, Copics (C00, YR12, YR14, Y06, Y08). For more inspiration from the other bartenders and our guest designers, please hop on over to the Raise the Bar blog and check it out! 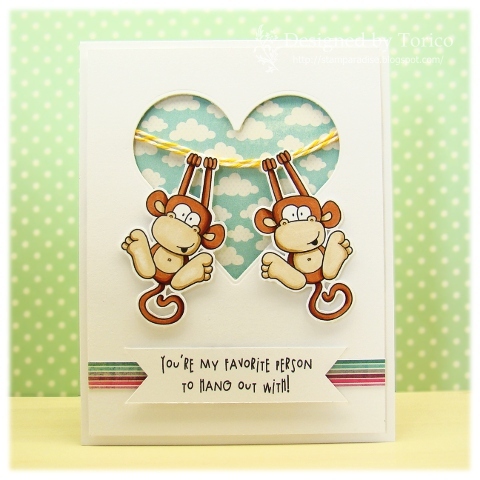 I'm on a cardmaking roll today...my third post here! Have to say I'm happy to add another card to my Christmas stash by CASEing another of Torico's cards for the Case Study Challenge (see card on the right). I used the negative die cut and sentiment banner elements from her card and this will be a flat, very mailable card for the holidays. ACCESSORIES: Fancy Framed Tags Two by SB, Christmas Tree #2 by Sizzix, Victorian EF by Cuttlebug, Gold brads. There's another noon time Wild and Wonderful Challenge on the Flourishes blog as they continue to celebrate a new release this week. This time we're to create a "rugged" card that would represent the wild west. I went with the wooden DP background that was distressed and sponged with Black Soot distress ink. I added black jute twine and figured these coneflowers are bound to be found blooming on a prairie! I love that this set has a matching Silhouette cut file...so much easier than fussy cutting! I used X-Press It Blending Card then colored with Copics. This uses Chupa's layout for her Sketch Saturday Challenge. ACCESSORIES: Postage Stamp Nestie, Square Nestie, Jute twine, Distressing tool. COPICS: YR12, YR15, YR18, Y19, YG93, YG95, YG99. Another beautiful fall day on board in VA! Love this time of year! Thanks for stopping by and commenting! Raise the Bar is Back!